Just a little note to say that our favorite and most inspirational blog site has now become a full- fledged website!! Yes! Learning Domestic Discipline has now become a brand new website!! Clint and Chelsea at Learning Domestic Discipline have been such an inspiration to our relationship. that we are on our way to a wonderful new way of communicating!! 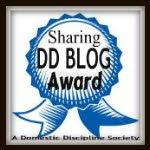 The Learning Domestic Discipline blog has guided many couples to new horizons - so a new website is just a wonderful blessing! PS - Don't forget that there is also a DD forum too! Great post! I love LDD too! !